The new SharePoint and Office 365 User Study 2018/19 has arrived. 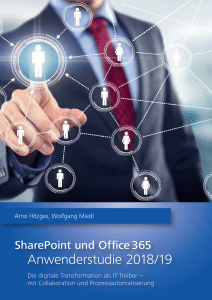 After 2014/15 and 2016, we have again conducted an extensive survey in German-speaking countries, asking users about their usage scenarios, strategies and satisfaction with SharePoint and Office 365. The results are now available as a report, with 49 informative graphics on 86 pages. By registering, you can download this entire report now as a free PDF. When implementing digital transformation, companies mainly rely on collaboration and workflow tools. 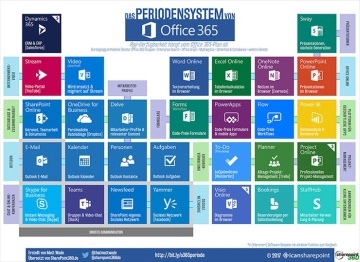 Outlook, OneNote and OneDrive are the most widely used Office 365 apps. Over 270 companies took part in our survey in August and September 2018. The participants come from all industries and company sizes, with 61 percent of them hailing from companies with more than 500 employees. The first exciting question was how the cloud, the major topic of recent years, has established itself in the user environment. 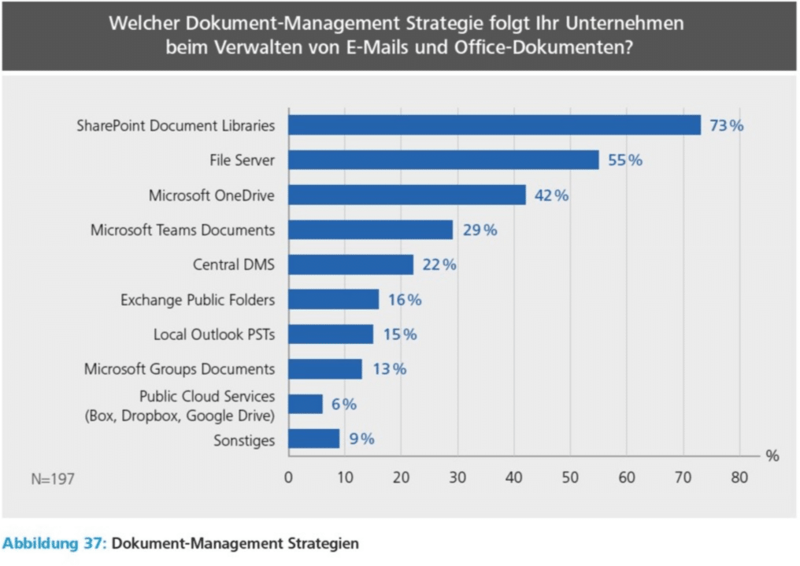 Microsoft made slow progress with Office 365 in the first few years, but recently there has also been a strong increasing interest in the German-speaking world. 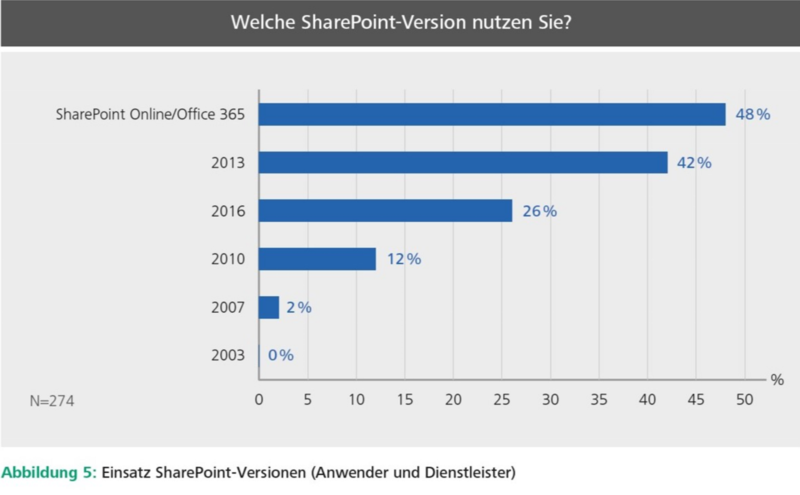 According to the survey, the use of Office 365/SharePoint Online rose to 48 percent in 2016, up from a meagre 15 percent in 2016. However, SharePoint server remains strong, with 46 percent currently relying exclusively on the on-premises version (2016: 64 percent). The most frequently used server version is 2013 (42 percent) with SharePoint 2016 at 26 percent. The hybrid operation of on-premises and cloud has also increased significantly. Overall, the acceptance of cloud-based solutions has increased significantly. When asked about general cloud usage, 74 percent said that cloud was either part of the company’s IT strategy or that it was used for non-critical services. 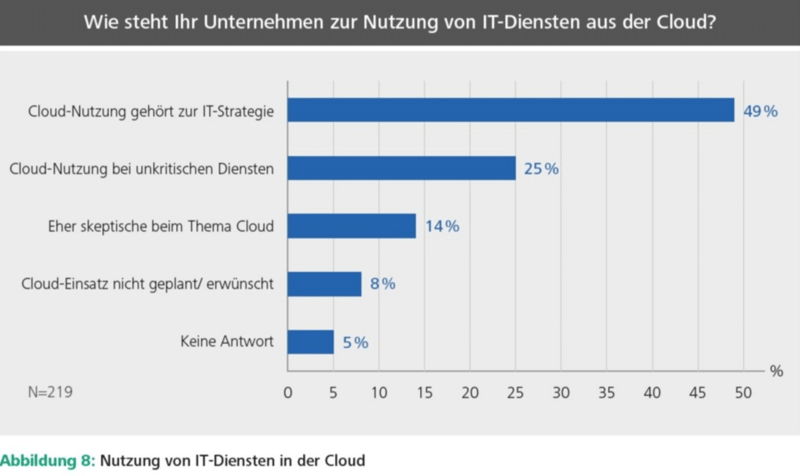 Only 22 percent of participants reject the cloud or are sceptical about it. However, they want to take a closer look at the source of the cloud services. 20 percent would like to obtain services exclusively from German data centres, whereas another 60 percent prefer a European location. If you take a closer look at Office 365 and analyse the usage and satisfaction at the level of apps, you will see a familiar picture. Even though Microsoft is constantly adding new apps to the suite, thereby increasing the complexity, the usual suspects still emerge as front-runners on the list. 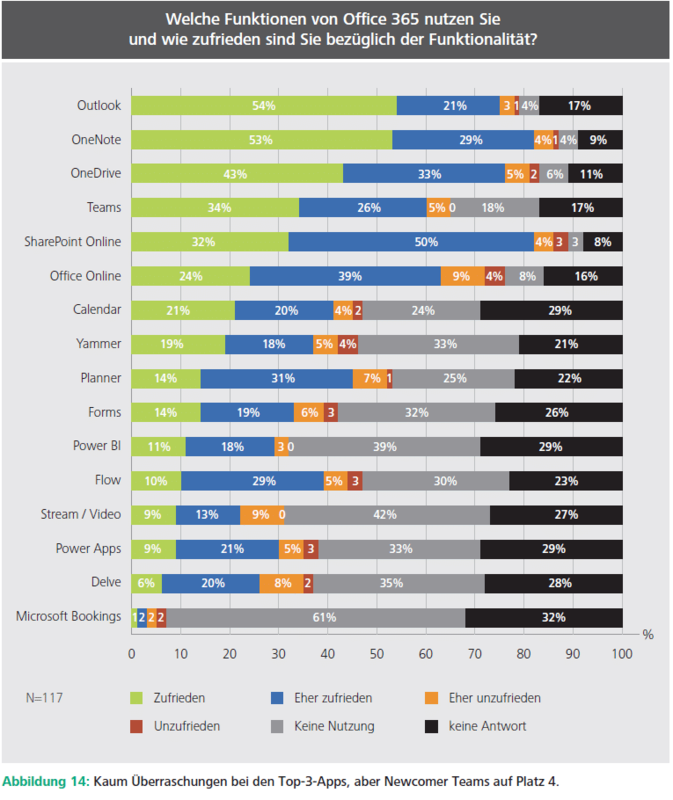 Users are most satisfied with the standard Outlook workstation, followed by OneNote and OneDrive. The newcomer Teams, a collaboration app that has only been on the market only since 2017, scored surprisingly well with fourth place. There are many ambitious apps trailing behind and exotic ones like Delve or Bookings are hardly used. 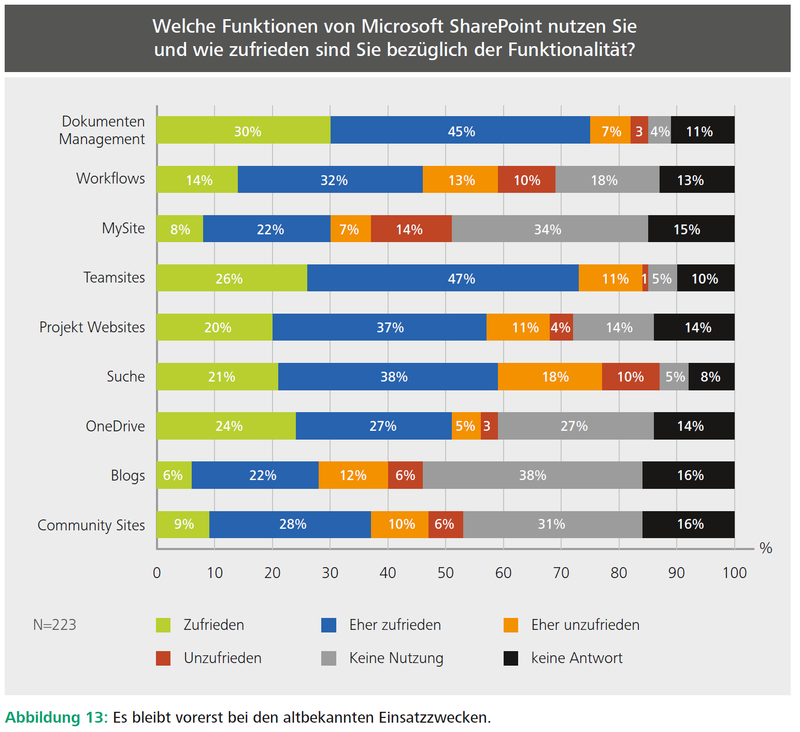 How does SharePoint’s own functionality look in terms of usage and satisfaction? Here, the three areas comprising of document management, search and team sites are clearly ahead, with over 90 percent usage. However compared to previous studies, user satisfaction has decreased somewhat – could this be a sign that SharePoint’s quality is suffering from Microsoft’s (??) focus on cloud? The question regarding the filing strategy in companies for office documents and emails provided exciting insights. In this area, Microsoft has managed to establish SharePoint as the most important storage location. 73 percent use SharePoint document libraries for structured storage on a centrally available system. However, the good old file server, which has actually been declared dead for a long time, is far from being obsolete and is seen as a valid storage location by 55 percent of the companies surveyed. 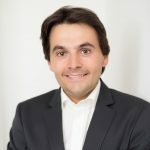 The digital transformation is currently regarded as an important driver for IT. For this purpose, we have examined the relevance of SharePoint and Office 365 as strategic business platforms. 76 percent of companies expect productivity gains, while 53 percent demand cost reductions and better employee experience. 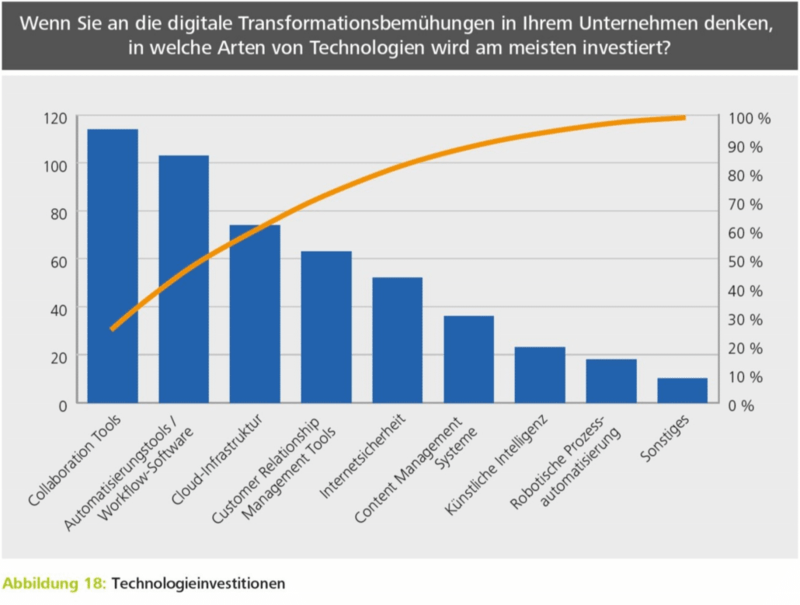 How do companies want to implement digital transformation? First and foremost with collaboration tools (59 percent) to improve employee collaboration. On second position automation and workflow tools (53 percent) were cited, and cloud infrastructure (38 percent) came third. The applications that still have a lot of growth potential include workflows and process automation. Currently, 55 percent of companies use SharePoint to automate procedures, especially for document-based business processes. Another 30 percent plan to use such solutions in the future. 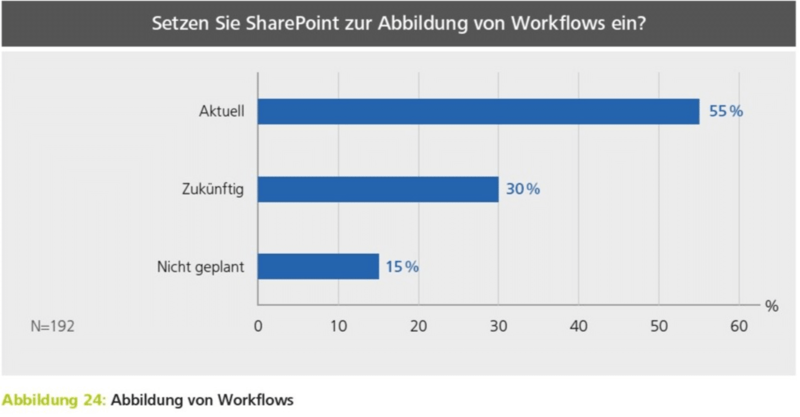 However it is noticeable that only 11 percent are satisfied with SharePoint’s own tools Workflows and Designer. Hence, for the providers of corresponding tools there is a great opportunity here.